Well now, after a flurry of publicity about so-called netbook computers, which are tiny computers with no disk drive, hardly any memory and a keyboard suitable for Barbie dolls, the many companies who make these are adding big screens and keyboards. They’re also selling plug-in disk drives. In fact they’re about to invent the desktop computer. Unfortunately, it’s already been invented. Just so they don’t seem like complete idiots, the makers of these new setups are calling them Nettops. That’s squeezing the words “Netbook” and “Desktop” together. Why did Asus, Lenovo, Hewlett Packard, Gateway, Sony and several others come out with these practically unusable Netbook computers in the first place? Because they thought they could sell them to you, that’s why. One of the things that truly burns Bob’s cork is the amount of techno junk that is produced every year. Just because it’s new doesn’t mean it’s a great idea. Joy’s dissent: The really cool thing about the nettop is that it uses only a third of the power of a desktop, and can be found for less than $200 at Amazon.com and other discounters. 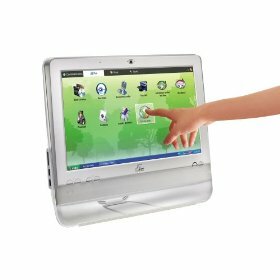 The “all-in-one” nettop, like the Asus Eee Top, is $500 to $600, but packs the computer into the monitor and has a touch screen.